Rochester Midland introduced a new BrandGuard Food Sanitation Program for fruit and vegetable manufacturers that reduces the risk of pathogens and spoilage microbes in fruit and vegetable processing lines. The new program is designed on HACCP based steps and reduces microbial levels both on produce, and on the processing water and equipment to minimize further contamination of the target produce. The results of the new Direct Intervention Program are pathogen reduction, extended shelf life and improve product appearance. 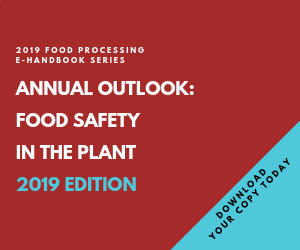 The fruit and vegetable processing industry has been under increased regulatory enforcement and consumer pressure in the past decade to eliminate E. coli pathogens from its supply chains. Direct Intervention addresses the single most important business issue for today's food processor: the safety of their product and the subsequent protection of their company brands. BrandGuard Food Safety gives you programs, products and dedicated people who work with you and your staff to design and implement the most effective food safety program available.